Hi guys, I using the Saito FG90 in mine and Sierra gears. It seems like I will need 2 lbs of weight in the nose to balance at 166 mm. Can someone tell me how much weight you have in the nose for this setup ? I have the same engine and can't remember how much weight I had to add. I put mine in the cowl ring, but two pounds sounds about right. Do what it takes to get to balance. 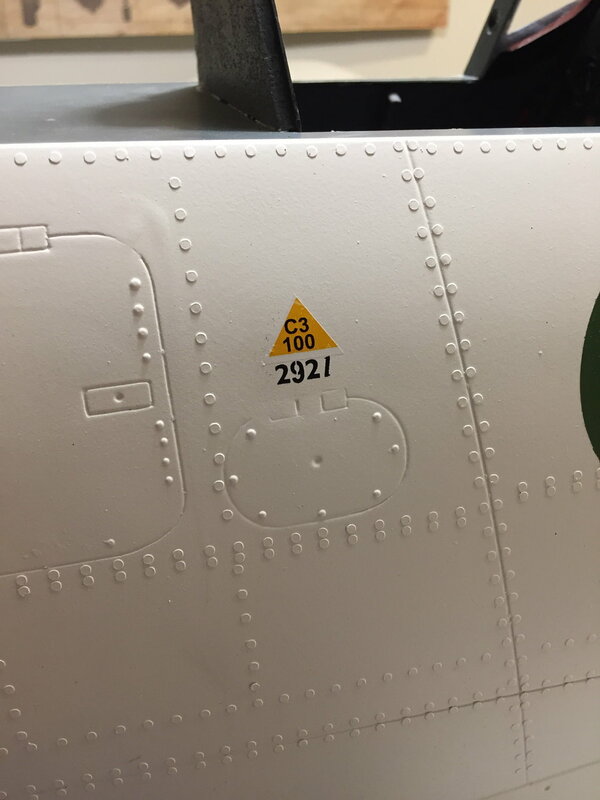 98% of the guys will never mess with CG after the initial W&B is done, which they should as it will make the plane more balanced and fun to fly. "Nose heavy airplanes will fly poorly, Tail Heavy airplanes only fly once!" I haven't started mine yet. I am leaning towards the Saito R90 for reliability an ease of maintenance. I was thinking on waiting on the new UMS125 but I don't have any experience with this motor. It would definitely take care of any question on power authorty and balance issues. One thing to consider is getting your engine serviced or repaired. I have an 84 and two 90's .Sending one back to Horizon is not an option I would entertain. I had a problem with one of them, can't remember which one, but I sent it to Ray English and the repair was completed in about a week at a very reasonable price. Ray is the one who designed the improvements on the intake and bearings on the original 84. His improvements are licensed to Saito and are now incorporated in the newer 90 versions. He lives in Nevada and always glad to answer questions. Valve adjustments are easy and not required very often. I just check mine at the beginning of each season. Plus, there are only 3 cyl. to adjust. Everyone loves the sound with the Keleo exhaust. Thanks for the response gents. Ray English did the mod for my R84 will definitely purchase thru him if I go with the R90. He doesn't sell them. The engines are purchased through Horizon which is the US distributor. Just to clarify, if I read your statement correctly. He did the modifications to my 60-R3 engine. I purchased from Horizon and had it sent directly to him and then he sent the engine to me ready to run. At the time I purchased mine, Ray was doing the warentee work on the engines for Horizon but that has changed since then. I already have a GT-80 for my plane or I wound stuff a 90 in mine. I'm not a fan of the exposed rocker arms on the UMS engine as they will get dirt and other stuff in there that will exacerbate wear. It appers now and I believe Ray has confirmed that the Saito radials have timing that is too advanced but if you get the engine and send it to Ray he will fix that issue too. Added a little over 13,000 vinyl rivets. Where did you get the rivets from? the rivets look awesome....which size did you use? I used 2mm vinyl rivets from Chad Veich. thanks tevans55...I’ve got Chads number, good stuff! Hello, I am starting my first giant scale rc and would appreciate some opinions. I just received my TopRcFW190 and would like recommendations on a spektrum compatible receivers that can power these 8 servos in the model. The servos I have are what the guys at VQ recommended, the Hitec HS-5645MG. My biggest concern is the receiver I get not having the current capacity to run 8 of these larger servos. the 8th one is to run the air system for the Sierra retracts I got with it. Also, anyone run a gyro with it? Hi, Scott. Welcome to Giant Scale War Birds.Sounds like you have a 9 channel receiver I don't think current draw will be your problem with any .Spketrum Receiver. A good choice would be a Spectrum Power Safe 12 Channel receiver. That way you will have battery backup ,mixing options , a channel for a gyro. Like anything, you can make it as simple or complex as you want. I saw the power safe 9 and 12 receivers and thought that might do it. Does the power and current go from the receiver through the gyro and the gyro only modifies the signal and not the power feed? Im only familiar with the little Admiral receivers with the gyro built in. It would be great if everyone that had one flying posted an all up weight, engine and prop size like Tim D from Florida did. Kind of a reference for noobs like myself. Lt. Thank you, thats exactly what I was hoping to hear. With that setup does it fly fast enough to look scale etc. Its so hard to tell without the experience of guy like you and I appreciate it. BTW. what the spec on the Biela 3 blade you are using? The MFG suggested weight will be a good start. It wont matter as long as you don't get too crazy with the details. Spektrum Power safe RX will be fine Current draw isn't an issue. Use a pair of 1100 or larger LiFe batteries I typically use the ones in the 2200 Mah range. Mine will be powered with a Zenoah GT-80 twin and sierra retracts. No Hi-Tec servos high end JR servo's for me. I have a lot of IMAC guys that fly at our new club so I'm starting to talk to them. 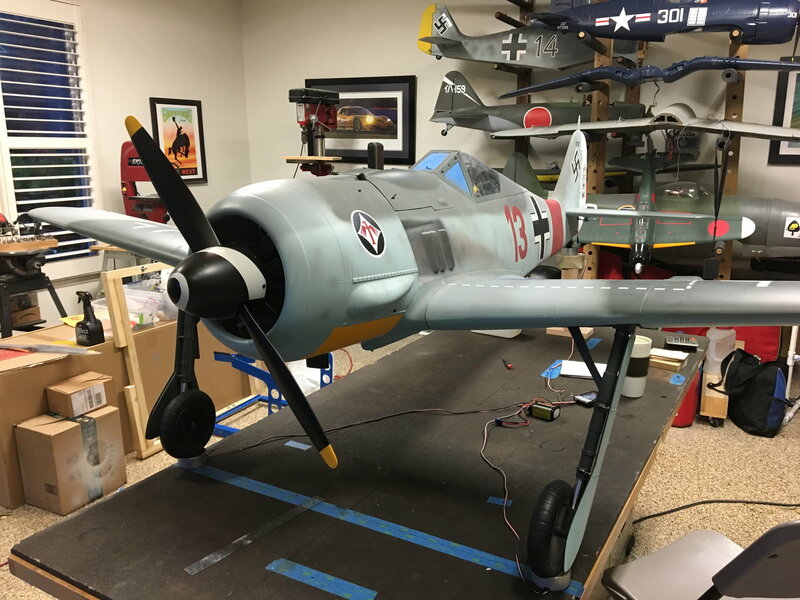 Only one other guy does big Warbirds but he is only there once every few months. I do have a Jet guru that is there every time im there so i have been picking his brain as well. Elmshoot, the Power Safe RX is what has been recommended and its nice to see you are doing the same thing. good to hear about total weight being workable. thanks for the input.